The children have been fully immersed into the season of Autumn today and have been exploring the changes we see in this season. The children began their day by looking at different Autumnal things and had a discussion around the different pictures. We discussed pumpkins, falling leaves, whistling winds, conkers, acorns, combine harvesters and many more things. Some children even pointed out the important of harvester to make yummy foods. 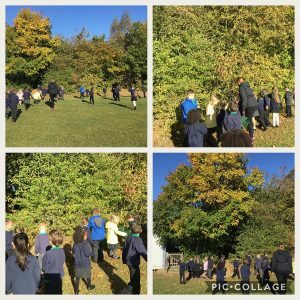 The children then took part in an Autumn walk, we travelled around the school grounds in search of all the things we had learnt about already and to look for new signs of Autumn that we didn’t know. The children noticed the moon was visible at the same time as the sun and we discussed how this happened in the different seasons. Lots of the children noticed the changes in the leaves and added beautiful vocabulary to describe this process. When we walked across the field we noticed our shoes got wet from the grass. We discussed the dew on the grass and how this was another sign of Autumn. Once we had explored all the areas of the school grounds, the children collected up as many different leaves as they could to create a chart of the different colours. To begin with, the children sorted the leaves into three piles and then organised the leaves further by how they were changing. I was very impressed with everyone’s teamwork skills as we all worked together to complete this challenge. 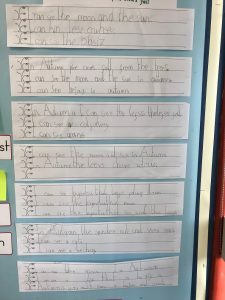 When the children came back into the classroom, we wrote individual sentences on our sentence strips to describe what we had learnt. The children had to really think about their kinetic letters, finger spaces, full stops, capital letters and even interesting vocabulary to complete their sentences. We had a very enjoyable day starting our new topic ‘Who is in the forest?’ and the children learnt lots of new things all about Autumn. ← Back to normal tomorrow.